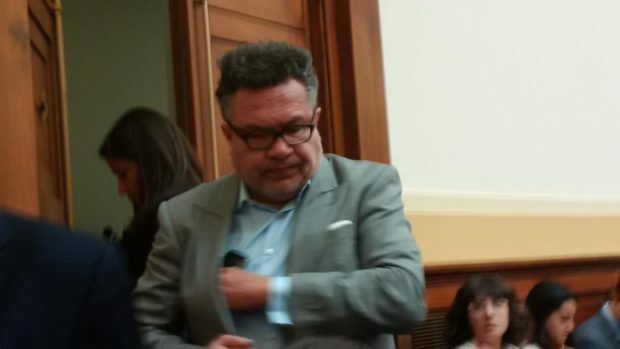 After it was reported on Friday that a suspected former Soviet intelligence officer attended the June 9, 2016, Trump Tower meeting, a mad dash is on to find out more about the man, Rinat Akhmetshin. A naturalized American citizen, Akhmetshin is often cited as a lobbyist, but details about his activities in Washington, D.C. portray him as something more. NBC News first reported that a suspected former Soviet intelligence officer accompanied Russian lawyer Natalia Veselnitskaya to the meeting. Akhmetshin later confirmed to the Associated Press that he attended. He is a well-connected political operative who works closely with Washington, D.C. reporters by providing opposition research on behalf of his clients. He has also formed several small non-profit groups aimed at advancing the interests of Russian clients and others from Soviet satellite nations. Salisbury denied the main allegation made in that lawsuit, that Akhmetshin had orchestrated a hack of the computer systems of a mining company called International Mineral Resources. Salisbury and Akhmetshin worked for a business rival of that firm’s called EuroChem. Salisbury said he had never heard Akhmetshin discuss hacking or any other “improper data gathering,” and Akhmetshin denied the charge, though he did say that he obtained documents from IMR through seemingly shady means. Akhmetshin acknowledged that he obtained the IMR documents through something called the London information bazaar, an information exchange network used by journalists, investigators and operatives. Akhmetshin said in the May 2015 deposition, which was obtained by The Daily Caller, that he gave a memory stick containing IRM documents to an Israeli businessman during a Jan. 30, 2014 meeting at a London coffee shop. The lobbyist-operative also has deep contacts to Washington, D.C. and international media outlets. Salisbury said that Akhmetshin frequently worked with the Wall Street Journal, The Financial Times and the Guardian. Akhmetshin “obtains research information” from the Soros-backed group, Salisbury said. As part of the IMR-EuroChem lawsuit, Akhmetshin was ordered to provide a list of people he emailed with as part of his work on that case. The list includes reporters from The Guardian, Harper’s magazine, and other outlets. IMR dropped the case last year, withdrawing its allegation that EuroChem and Akhmetshin hacked the firm’s computers. Akhmetshin was also identified as the force behind a smear campaign waged against Ashot Egiazaryan, a former deputy for the Russian Duma. In 2011, Egiazaryan accused Akhmetshin of spreading rumors and false stories to reporters in order to prevent him from obtaining political asylum in the U.S.
Egiazaryan sought asylum because he faced criminal charges related to a business dealing involving a Russian billionaire. RadioFreeEurope reported extensively on that legal case. He has also formed or been linked to at least three small non-profit groups that deal with issues related to Russia or former Soviet nation. He founded the Azeri Democracy Initiative Foundation and Kazakhstan 21st Century Foundation, according to lobbying records filed with Congress. He is also a registered lobbyist for the Human Rights Accountability Global Initiative Foundation (HRAGIF). It was with Natalia Veselnitskaya, an associate of HRAGIF, that Akhmetshin attended the Trump Tower meeting. That meeting was attended by Donald Trump Jr., Jared Kushner and Trump campaign chairman Paul Manafort. Emails released by Trump Jr. show that he agreed to the meeting after being promised that he would be provided with negative information about Hillary Clinton. Akhmetshin told the Associated Press that Trump Jr. asked about the information, which Veselnitskaya ended up not providing. He also said that Veselnitskaya brought documents with her to the meeting, but he said he did not know what information was in those documents or whether she gave them to the Trump team. HRAGIF was formed last year under the auspices of ending Russia’s ban against U.S. citizens adopting children. Russian president Vladimir Putin enacted the ban in retaliation for passage of the Magnitsky Act in 2012. That law allows for sanctions to be placed against Russians accused of human rights abuses. California Rep. Dana Rohrabacher, a Republican who has praised Putin in the past, has acknowledged meeting with Akhmetshin. CNN also reported earlier this year that Rohrabacher and Akhmetshin were spotted meeting in Berlin. Akhmetshin and Veselnitskaya have another strange connection. Also involved in the anti-Magnitsky lobbying push was Fusion GPS, the opposition research firm behind the uncorroborated dossier alleging various misdeeds by President Trump and members of his campaign. Fusion GPS was hired by a law firm called BakerHostetler to investigate Bill Browder, the London-based financier lobbied heavily to pass the Magnitsky Act. Sergei Magnitsky, the namesake for the law, was Browder’s lawyer. He died in a Russian prison in 2009 after being arrested while investigating a $230 million money laundering scheme that targeted Browder’s operations in Russia. Veselnitskaya’s client is Denis Katsyv. His firm, Prevezon Holdings, was implicated in the scheme. The entire complex swirl of operatives — Akhmetshin, Fusion, and Steele — have recently drawn the attention of Senate Judiciary Committee chairman Chuck Grassley. Fusion GPS has denied knowing about the Veselnitskaya/Akhmetshin meeting at Trump Tower. Akhmetshin has denied that he is affiliated with Russia’s intelligence agencies. But Browder says he doesn’t buy that claim. “What this shows is that the Russian government was using intelligence assets like Rinat to run a highly resourced, very aggressive campaign to influence US policy to remove sanctions on Rusian torturers and murderers,” Browder told TheDC of the revelation that Akhmetshin was involved in the Trump Tower meeting. Akhmetshin is also a regular attendee at the Halifax International Security Forum. That happens to be the same conference where Arizona Sen. John McCain was first told of the Steele dossier. Sir Andrew Wood, a former British ambassador to Russia and a business associate of Steele’s, discussed the dossier with McCain and one of his longtime associates, a former State Department official named David Kramer. Kramer flew to England to obtain the dossier from Steele. He gave it to McCain, who provided a copy to then-FBI Director James Comey during a meeting in December. There is no indication that McCain and Akhmetshin met at the conference.